In a saucepan mix butter, oil, salt, sugar, vanilla sugar and water. Put on fire, till butter melts. Remove from fire and pour it in bowl, cool it, but it might be warm. Add egg and portions of sifted flour. Make an elastic dough, knead it well. Cover it and leave for 40 min. Heat the oven at 200℃, cover the pan with a baking paper. Peel apples and pears, dice them well. Powder the table with flour, roll the dough, at the beginning you can turn it. When it will become uncomfortable, you can roll it without turning like stretching it with a rolling pin in different directions (the dough is fat and it won`t stick to the table). You can lift the edges and add flour under them. Roll dough as thin as possible, but try not to spoil it It`s very gentle. 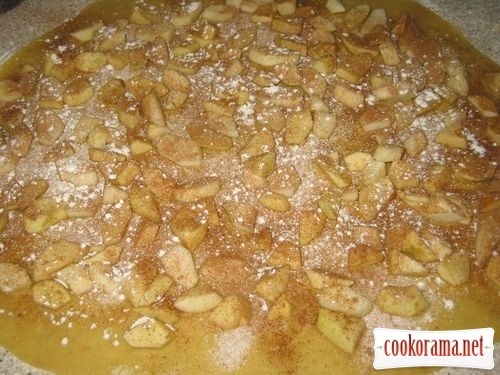 Ready layer of dough grease with softened butter, sprinkle with breadcrumbs, put pears and apples, sprinkle with sugar, cinnamon and flour. Carefully make a roll, shift it on a baking sheet seam down. Squizze edges and wrap under the bottom. On the top of roll put soft butter and, if you wish you can add egg (I did not grease). 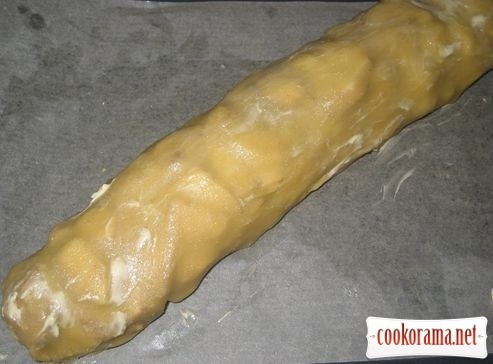 Bake the strudel until golden brown, cool it off. 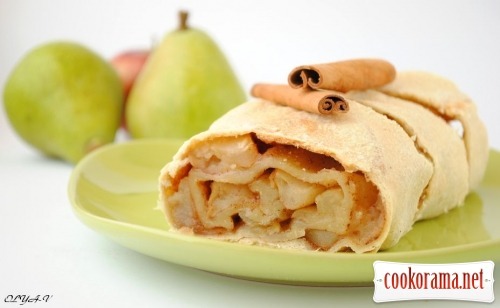 Top of recipe "Apple-pear strudel with cinnamon"
я всегда в штрудель пихала только яблоки и вишни… спасибо, что про груши подсказали!